Love em’ or loath ‘em, The Hangover trilogy has proven to be one of the most popular and successful comedy franchises of the 21st Century so far, leaving its own mark in the Vegas sand as possibly the best big budget buddy/road movie series since the Rush Hour films. This scene sums up the brilliant sense of anarchy that underpins everything which is great about The Hangover films. 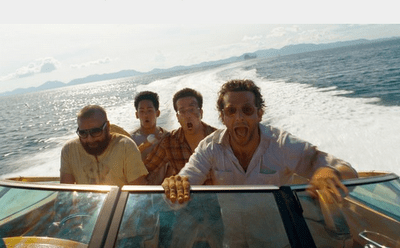 Hangover 2 sees the wolf pack lost in Bangkok ahead of dentist Stu Price’s wedding. They manage to make their getaway to Price’s idyllic beach wedding, and arrive in fantastically chaotic style, beaching themselves amidst the matrimonial fanfare in a speedboat. Stu’s ensuing ‘wild not boring’ speech is also a treat! Could there ever be a greater moment of cinema than the scene in which a naked Leslie Chow springs out of a car boot and beats the heroes brutally with a crowbar? We think not. Alan’s ‘Rain Man Moment’ in the original film was an excellent pastiche, sending up the heist movie genre brilliantly whilst offering the loner Alan a chance to shine, as he wins back the money required to turn around the group’s dire situation by counting cards to cheat at blackjack. Card counting is absolutely possible if you have a great memory, but it’s also illegal, so if you try it out you’re playing with fire. Online casinos such as www.coral.co.uk/casino/top-games preclude the activity through the design of their games, but with real cards it can be done… There are several books on the subject if you want to read up on how Alan does it! In a series much feted for its great cameos, this could well be the finest, as the socially awkward Alan lasciviously takes a lollypop out of his mouth and places it into Melissa McCarthy’s. Deeply disturbing.